I have a really exciting announcement to make! 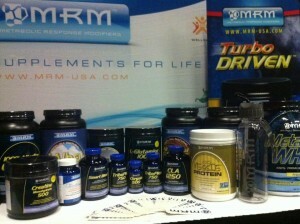 I have decided to partner and team up with the nutrition and supplement company MRM (Metabolic Response Modifiers)! I began using their products about two years ago when I started getting into shape. Their whey protein and SmartBlend capsules are in Jamie Eason’s LiveFit stack on bodybuilding.com and when I started her program I used the recommended supplements to get the best results and got hooked on MRM’s products. These are the products I’ve used the past two years to get in shape after my pregnancies. What I love about this company is that they really limit the use of fillers and artificial sweeteners in their products (which is why I have felt comfortable using their products while pregnant and nursing). Plus their powders all taste awesome and mix really well without getting clumpy. They have a long-term health approach and are a very family-oriented company. I am really excited for our partnership! I’ve had other companies approach me in the past and never felt totally comfortable putting my name behind a product that I didn’t use myself or that I didn’t totally believe in. The reason I think it is a great fit to partner with MRM is because these are the actual products I use myself, I believe in the products, I know they use high quality ingredients, and I feel entirely comfortable recommending them to you guys. We have a lot of really cool things planned as we work together. I am going to be releasing a recipe of the month that I will share with you guys and keep a section of all the recipes here on my site, we are going to offer a ‘stack’ with the same exact products I use each month that you guys can purchase at a discounted price, free product giveaways just for you guys, and a lot more! I am also going to work with them in their booth at a number of fitness expo shows throughout the year! I am so excited about this because it will give me a chance to meet so many of you guys in person! Are you going to be at any of these events? Do you live near these areas? You should consider coming I would love to meet each one of you! Make sure to keep in touch with MRM on their Facebook (click HERE for the link) and Instagram pages (@mrm-usa) to find out about all the cool stuff they have going on! You can find MRM products in stores like: Whole Foods, Trader Joes, Sprouts and more. I am currently doing the LiveFit program and Im taking the MRM veggie protein for postworkout. I already take a multivitamin and a fish oil. I wanted to know if I should add a BCAA and which one do you recommend? I just feel iffy about putting things into my body. Thank you once again Natalie!